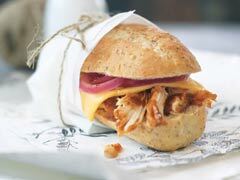 Make a fabulous grab-and-go sandwich with this Shredded Chicken Sandwich Recipe. Add KRAFT Barbecue Sauce for a flavorful filling! Bring water to boil in large saucepan. Add onions; cook 5 min. Drain. Place onions in medium bowl. Add sugar, vinegar and pepper; mix well. Cover. Refrigerate until ready to use, stirring freqently. Meanwhile, combine chicken and barbecue sauce in saucepan; cook on medium heat 5 min. or until heated through, stirring frequently. Spoon about 1/2 cup of the chicken mixture onto bottom half of each roll; top with 1 Singles and 1/4 cup of the onions. Cover with tops of rolls. Stir 1/2 tsp. of crushed red pepper into chicken mixture before heating as directed. If you don't have any leftover cooked chicken, use a rotisserie chicken purchased from your supermarket.